What do you think about Battle for Azeroth's skill pruning? What do you think about Battle for Azeroth’s skill pruning? I don’t play a Shadow Priest, but while reading Mitch’s post about his favorite class/spec in the beta, I realized some of the things he was saying sounded awfully familiar. Because some of the things he said mirrored things I’d been thinking about Windwalker Monks, my go-to class at the moment. Their rotation just feels weird. 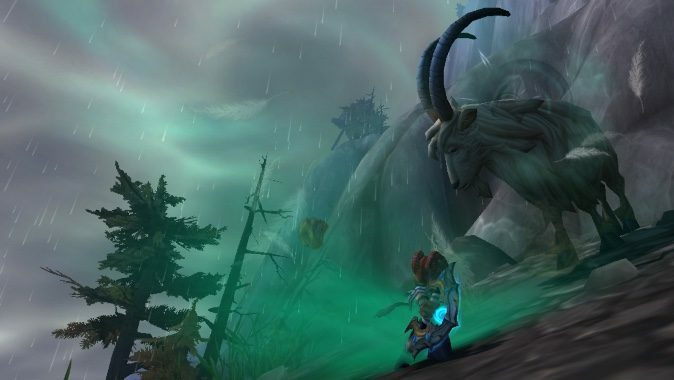 We’ve lost our Artifact and all of its associated buffs without anything to replace it, and that’s left the rotation feeling somewhat stilted. Perhaps it’s something I’ll get used to. So far I haven’t had any actual trouble playing (so long as I avoid more than a couple of mobs at one). But I am moderately unhappy with the new feel of the spec… especially since Blizzard has said we shouldn’t expect major design changes at this point. (So here’s to hoping I get used to it.) I will, however, grant that Rushing Jade Wind is currently ridiculous because it’s bugged and uses no Energy: in short, I can wander around with a tornado surrounding me wherever I go. But I assume they’ll fix that, so this small tornado-y joy will soon be lost. However, I usually play a healer — which means while I’m playing Windwalker to quest, I’ve been contemplating just how Mistweavers will play. (And trying to twist my coworkers’ arms into running some dungeons so I can get some hands-on experience.) Mistweavers have lost the single-target heal Effuse, with a castable version of Soothing Mist perhaps intended as a replacement. If you have any idea what I’m talking about, that’s just weird, right? All in all, the rotations of the two specs I play most are different enough to feel off. And that’s the toughest part of any new expansion — or, sometimes, patch — getting used to your class feeling like a new class. Again. And again. And again. So after all of that rambling I want to know what you think. Whether you’re in the beta or not, how does the game’s latest round of pruning look to you?